(Oppsss, this is the first time I have blogged in the New Year!) Can’t believe it is already 2015, 2014 seemed to fly by! I am really excited for the new year though and I have set myself a few goals this year, which I may do a post about very soon! Like a lot of people I really want to read a lot more this year, I have been reading a lot since I began my internship in June, and would really like to continue this in 2015! I find reading really soothing, helps me sleep better, improves my writing skills and provides me with a little bit of escapism in my life. Basically reading is fabulous! 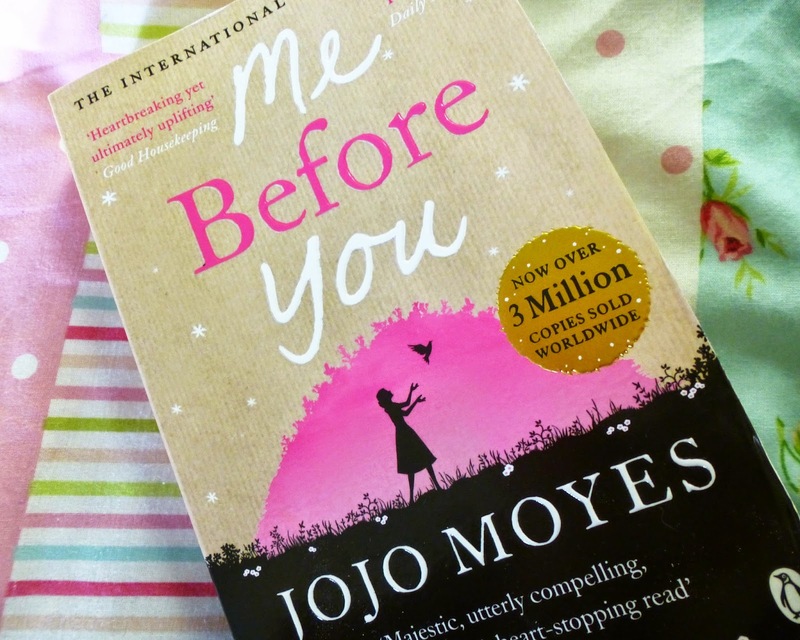 This posts is about ‘Me Before You’ by JoJo Moyes. I had my eye on this book for a long long long time, after such brilliant reviews on Amazon! It currently has 4863 reviews as I write this, with a 5 star rating, which really is incredible! Whilst I was purchasing some Christmas presents off Amazon, I decided to add this little gem to my basket! I thought I would bring this title to my lovely followers eyes, in case you hadn’t heard of it before! I am SO glad I purchased this! I read this really quite quickly, I was very hooked! I don’t think I actually read the blurb for this book, because whilst I was reading it, it really wasn’t about the subject that I thought it was. It is a girly romantic kind of story, with a twist. I really like JoJo Moyes as an author, after reading The One Plus One on holiday to Rhodes this year. I find that Sophie Kinsella has a similar writing style / subject, and I really like her too! 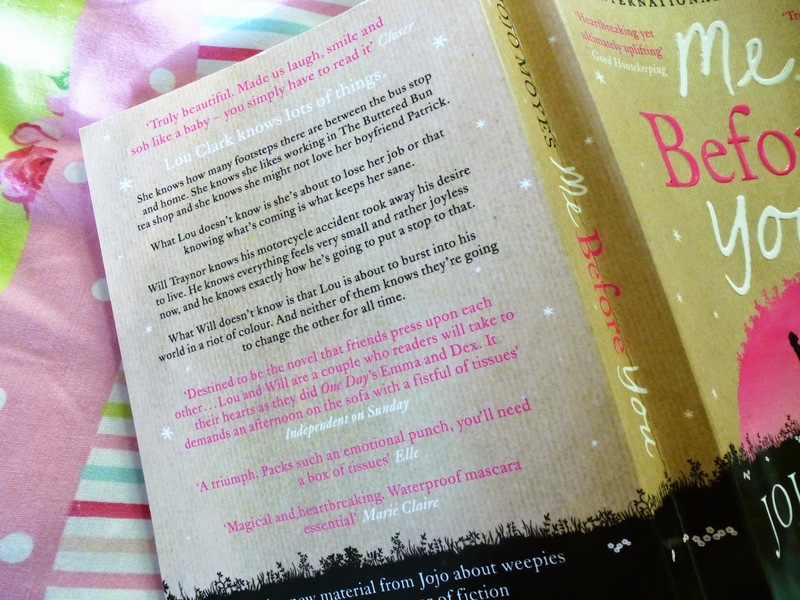 This would be such a lovely holiday read, but also a lovely cosy by the fire or in bed read! A really lovely story, I found myself smiling throughout, but be warned, that you will need tissues for the ending, it was very emotional and I cried for quite a while, and I couldn’t get to sleep because it upset me that much 🙁 Haha, I don’t usually get upset by books.. but I definitely do in films, so it really surprised me how much I cried over this story! The storyline is so so thought provoking, and I LOVE a thought provoking read, I don’t want to spoil it for anyone, but it just really made me think, and the ending wasn’t what I expected! You really warm to the characters and I feel I kind of appreciate life more, I felt the same after watching / reading ‘The Fault In Our Stars’ too. I worry about an awful lot of things in life, but these two books, as cheesy as it sounds, both hit me in the same way, in that I feel they change my perspective on life. I should stop worrying and appreciate life whilst I can really! I read this book on my holidays earlier on in the year and I LOVED it! I read it fairly quickly, but it was just such a good read. Really connected to the characters as well, which I think is so important in a book! I've spent the last month telling everyone to read this book! Isn't it amazing! I posted about it too a few days ago on my '5 Favourites' post, take a look if you like. Happy New Year! I've heard a lot of great stuff about this book. I'll have to check it out! I have note read this book but it sounds great (: I'll have to put it on my list! Need to buy this SOON like literallyy. I'm obsessed with reading novels, this novel sounds amazingg! This sounds amazing! Always on the look out for a good read! Anything else you would suggest? I really like these types of post, one of my new resolutions is to read more and I am always looking for good book recommendations. Might give this a read! Apart from the fault in our stars the only other book that made me cry was the first last kiss that was a great read to.